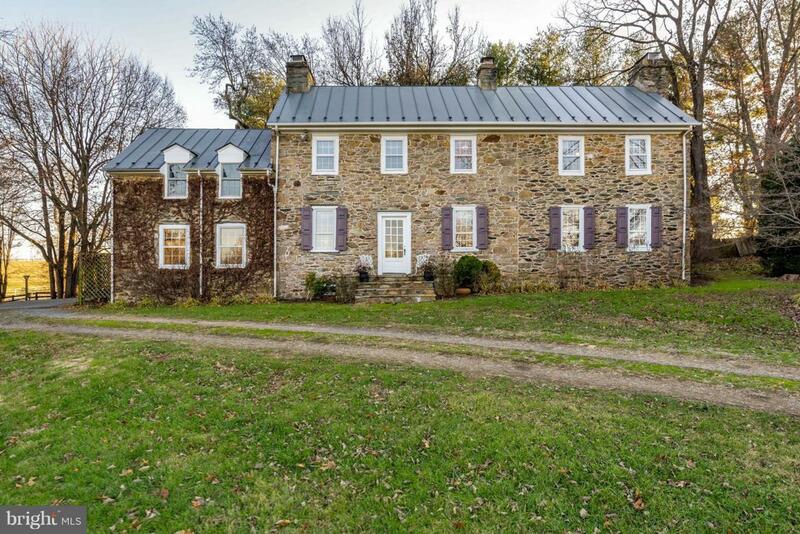 This home has so many possibilities, AirBnB, winery, horses/cow/goat in the 3 stall Barn with electric and water for the kids, or a second home get a way maybe. The driveway allows for ample parking. This is a rare find, so close to Purcellville, yet out in the country. This Beautiful historic home has been updated with all the modern amenities. Located on 6.84 acres, this 4 bedroom, 3.5 bath home features original hardwood floors, chestnut beamed ceilings, a remodeled kitchen with leather-finish Brazilian soapstone counters, custom cherry cabinets and a Dual Fuel Thermador 6 burner range, formal living and dining rooms, a study and main level master suite with walk-in closet, fireplace and an updated bath. Upper level has 3 large bedrooms with ample closet space, 2 full baths and play room/den/rec room. Home is wired with Verizon FIOS, has a 60-year metal baked enamel roof, forced air furnace and radiant heat (3 zones), 4 wood burning fireplaces, 1 wood stove, central air, stone exterior, 3-stall barn with electric and water and storage shed. 13 month Home Warranty with Home Warranty of America in place...Originally built in 1791 with additions in 1840, 1975 and 2012, several professional renovations have kept this home timeless to the period yet solid, sound and efficient for today's lifestyles Features include exposed stone walls, stone flooring, exposed Wood Beams, Pocket Doors, Crown Molding, Chair rail. Owner can provide complete history of the home. Listing courtesy of Sink Realty Group, Llc..